A local treasure, Fiano is the good ol' faithful of cycling in Lucca. Only 12 km away and easily reached won't detract from its fascination. Similar to a charm bracelet, Fiano's only complete with accessories like Passo Lucchese, Passo Sella or Fondagno. The first climb I did in Italy that also happened to steal my heart. Like Fiano, it's a local climb that can be stacked with other climbs like you'd construct a lego castle. It's an essential that overlooks the Med within 30 minutes from Lucca. You'll have a Strava empire fuelled by stracciatella in no time. This mountain is Pisa's pride and joy. It's their only mountain, and with an ancient history of animosity, they'll never let you presume it belongs to the Lucchesi. It can be "mounted" as the Italians say three ways to the same summit: Buti, Calci, and Sant'Andrea di Compito. All three merit exploration but note that Sant'Andrea is the longest, hardest, and closest to Lucca. The view from Calci of Pisa's sprawl, the Med and on a clear day, the leaning tower should help transcend your suffering. Nestled in the Pistoiese mountains, Vellano is an underutilized porthole to La Lima and the beautiful and elegant Sérchio Valley. There's a grand piazza in Pescia with a plethora of cafe's might you need to draw one final arrow from your quiver before entering the enchanting forest. Once beyond Pescia you're in the land where country folk are downing caffè corretti at lunch and retirees absorb the sun's rays from public benches hours on end. Consider San Baronto a stairway to heaven where bicycles coast on clouds and cars and motorcycles are prohibited. Where one can ride all day without any threat of crisi di fame or crisis of hunger. If not heaven then surely enlightenment. San Baronto raises you to the ridge where Leonardo da Vinci conceived the Mona Lisa. More accurately, where Leonardo was born on April 15, 1452. Don't forget to take a selfie in appreciation of cultural, societal and creative advancements during the Renaissance. Preferably with a stick. Where the Tuscan's ski. But let's not talk about snow. I wouldn't touch Abetone in the winter with even a ski pole is how I feel about rain at sub-zero temperatures. In the summer it's the best 160 km out and back ride you'll do. 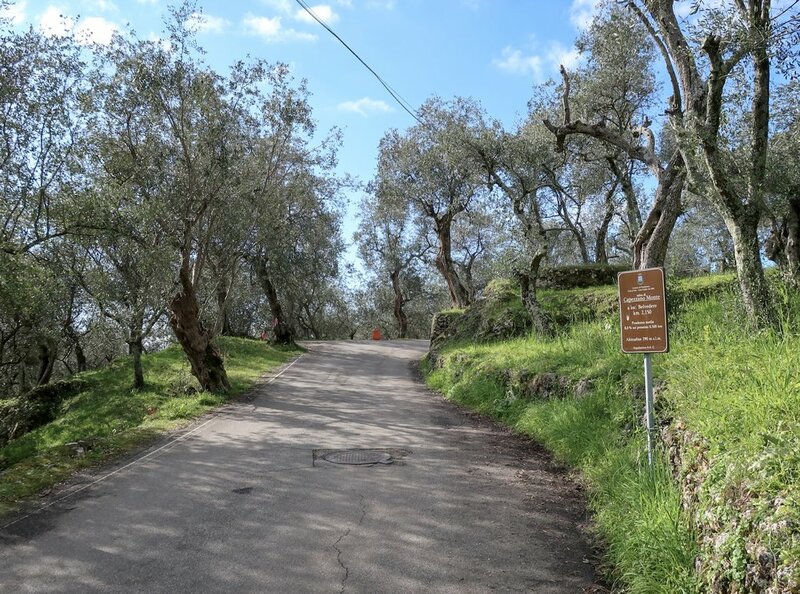 A gradual uphill along the Sérchio river until you're 15 km from the summit where the road pitches upward. Yet on average, it's not steep, especially knowing once you get to the top it's practically all downhill back to Lucca. Sella is saddle in Italian, and to me, it's the closest link from Lucca to Garfagnana Valley. The Lucchese side is steeper with a gradual descent through Fabbriche di Vergemoli (shown) where I heard they're selling houses for €1. At the top, there's an option to take a slightly longer route or a shortcut. Take the longer route, it's well worth it. Would also advise you spend your euro on a cappuccino instead of these houses. Growing up in North America watching TGIF programming while eating Doritos I believe to have understood the town of Pietrasanta is a highly cultured place. The home to painters and sculptors, Pietrasanta proudly displays the fruits of their labor, and the ring road with climbs, Capezzano and Caprilia is no exception. Take in the statues, the cathedral, and maybe also a panino from the piazza before zig-zagging up the hillside where you'll see all of Pietrasanta from above and the Mediterranean sea on the horizon. My newest discovery, this little piece of paradise is accessed through either Passo Sella or Garfagnana. The road takes you around the Pania della Croce, Panie being a series of peaks in the Apuane Alps and Croce trumps them all (see no. 1 why). It's a jewel; if you can dedicate a day to Vergemoli, don't pass it up. Oh, and stop for lunch in Barga and load up on pasta because you'll burn through kilojoules at the rate Juan Pelota did epo. This one's my absolute fave, and I've only been up a few times. You'll literally and figuratively die on the Cross, but its beauty guarantees your resurrection. Only a 2-hour warm-up spin from Lucca, you'll ride most of Cipollaio, 10 km pedalabile, yes pedalable before taking a right up to Croce. Mount Cipollaio from Saravezza where you'd be wise consuming a gelato or espresso before steamrolling the next 16 km of asphalt tilted upwards. So about 10-12 km on Cipollaio before the final 6 km up to the mountaintop. Not a lazybones pursuit but a view of the Promised Land never is. Will you be cycling in Lucca and venturing on your own? Sign up for a 66km (1500m) Lucca essentials loop. Hope you love it.